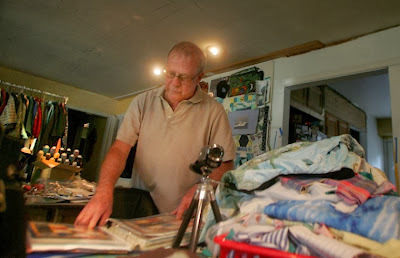 Today in our local newspaper I came across an article about my friend and Quilters Dream customer Jerry Callender . It is a very nice write up which recognizes his talents, creativity and more importantly, compassion. Jerry's skills of repurposing memorabilia has brought numerous smiles to those who are sick or have lost a loved one. I thought I would share it with you but first, how about I let you in on how I know Jerry personally. One of the best things about quilting is the quilting guild. 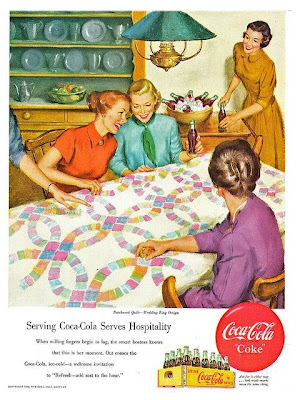 I remember my mother joining together with a group of about a dozen ladies from her church, laughing, praying, and quilting in what, at that time, was called her Quilting Bee. Sometimes they would meet at the church but often it was held at someone’s house – food was pot luck and the hostess would provide wine, “pop” (I was raised in the North), or other brews, and I would sometimes be present to witness this wonderful group of ladies who quilted love, fun, and laughter into every quilt they made. We want to hear from you!! The responses have been great so far. Don't miss out on your chance to win FREE batting! Click on our FACEBOOK page and leave a comment with your quilting dream to be entered in the drawing. Post by Quilter's Dream Batting.